U.S. officials vowed Sunday they would not make any concessions to North Korea ahead of a planned summit between U.S. President Donald Trump and North Korean leader Kim Jong Un and continue to pressure the Pyongyang regime. "Make no mistake about it, while these negotiations are going on, there will be no concession made," Central Intelligence Agency director Mike Pompeo told "Fox News Sunday." Pompeo said the North Korean ruler must "continue to allow us to perform our military-necessary exercises" with South Korea, "and then he's got to make sure that he leaves on the table that discussion for denuclearization" of his military. White House spokesman Raj Shah told ABC News, "The president has not adopted some of the failed policies we've seen over the last several decades, which is negotiations and concessions out of the gate from the United States. Our policy is pressure. It's pressure from our partners and allies around the world, pressure from the United Nations, pressure through China." 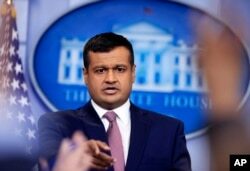 FILE - White House deputy press secretary Raj Shah speaks during the daily press briefing in the Brady press briefing room at the White House, in Washington, Feb. 8, 2018. He added, "These have impacted Kim Jong Un's behavior. It's impacted his conduct. So we're hoping that this pressure campaign, which is not going to relent in the coming months, is changing North Korea's behavior." Shah said Trump "inherited a policy that wasn't working for the previous eight years" during the administration of former President Barack Obama. In contrast, Shah said Trump had "adopted a policy of maximum pressure on the North Korean regime. We've seen China dramatically reduce trade with North Korea" and the United Nations adopt "some of the toughest sanctions" against Pyongyang. Treasury Secretary Steven Mnuchin told NBC News, "There's no question these sanctions are working and that's what brought them to the table." Shah said that in advance of the Trump-Kim talks, North Korea has agreed to cease missile and nuclear testing and "to not object publicly to upcoming U.S.-South Korea military exercises." Shah gave no hint about where the Trump-Kim meeting might be held. He did not rule out holding the meeting at the White House or in Pyongyang, but said, "I don't think it's highly likely" to be in the North Korean capital. He underscored the White House's view of the importance of direct talks with a North Korean leader, something no previous U.S. president has undertaken. "We think that Kim Jong Un is the only partner in North Korea that has any authority to make any decision," the spokesman said. "He's the only voice. "We hope that there can be a breakthrough," Shah said. "Eventually a peaceful resolution is going to involve some level of negotiation. We hope this is the path forward." Shah offered no commitment that Trump would raise the issue with Kim of releasing three Americans currently held by North Korea. "I'm not going to place any condition on any upcoming talks," he said. "It is an important issue, but again, our policy is maximum pressure to denuclearize the Korean peninsula." 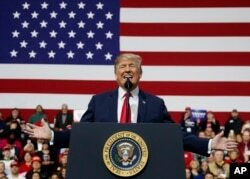 U.S. President Donald Trump speaks at a campaign rally at Atlantic Aviation in Moon Township, Pa., March 10, 2018. In the past, Trump has derided the possibility of direct talks with North Korea, in October telling Secretary of State Rex Tillerson he was "wasting his time" considering the possibility of negotiations. But on Saturday Trump noted the historical significance of him accepting the North Korean leader’s offer to meet. "Well, they say, well, [former President Barack] Obama could have done that. Trust me, he wouldn't have done it. By the way, neither would [former President George W.] Bush or [former President Bill] Clinton," Trump said. "Anybody could have done it. Obama could have done it. Obama had his chance." But skeptics remain about Trump's agreement for a face-to-face meeting with Kim. Asked what Trump could accomplish by being nice to Kim, Republican Senator Ron Johnson of Wisconsin told CNN on Sunday, "Not a whole lot." A Democratic opponent of Trump, Senator Elizabeth Warren of Massachusetts, said on NBC, "I want to see our president succeed, because if he succeeds, America succeeds. The world is safer. But I am very worried that they're going to take advantage of him."